Can Ireland improve its competitiveness while raising taxes? If you were looking for just two indicators to summarize how Ireland’s economic model of the 1990s, based on international competitiveness and fiscal rectitude, became perverted in the 2000s, the following two would be the ones that I would use. Firstly, according to OECD figures, the average wage in Ireland grew by 37% between 2000 and 2006, while in France and Germany, the anchors of the Eurozone, average wages grew by 15% during the same period. Secondly, while the typical two-income, two-child household in France paid over a steady 22% of their income in tax during the 2000s, and their German counterpart paid one third in tax, by 2006 their Irish counterpart was paying barely 10% in tax. It is no surprise that both these trends have proven unsustainable and in the last three years, Ireland has been trying both to regain international cost competitiveness and to put its Exchequer on a sounder footing. On incomes, since 2006, wages have been static: OECD figures suggest that a household with one earner on the average wage and another earning two-thirds of a full wage earned €65,900 in 2010, barely up from the €65,600 they earned in 2006. In contrast, wages have grown by almost 10% in France and Germany, while they have been static in Ireland. If wages continue to be largely static in Ireland between now and 2014, rising by just 1% a year on average, this would mean that wages would have risen by 43% between 2000 and 2014. If current trends continue elsewhere, this would compare with a 52% rise in the Netherlands, 42% in France, 38% in Austria and 31% in Germany. Likewise, the tax burden is reverting to normal. In 2006 it was just 11% compared to an OECD average of 20%. In 2010, it had risen to 13% and – with reduced tax credits in particular but also perhaps taxable child benefit – it is likely to reach 18% by 2014. So far, this just sounds like yet another economist drooling over austerity. But this matters for our future prosperity because Ireland needs to restore its competitiveness. The good news is that Ireland has been making significant inroads to restoring its competitiveness over the four years. Key to this has been the collapsing property market. There is lots of worry at the moment about what kind of Ireland this generation is leaving to its children. I’ve outlined before how the banking debt is almost certainly going to be not a worry for our children and grandchildren. On the other hand, while falling property prices are bad for the generation who bought in the 2000s (born in the 1970s), they are really good news for those who will be looking for work in the 2010s (born in the 1990s). To see how this connects back up to competitiveness, remember that just as income levels determine property prices, so do property prices determine wage demands. In an economy ticking along without bubble or crash, people will set aside about one quarter of their wages to cover accommodation, either rent or mortgage repayments. So if house prices fall by a half, that frees up disposable income, even if taxes increase. The graph below explores the impact both of falling prices and the reordering of Ireland’s financial system on mortgage repayments. Ireland’s property prices look set to fall by between 55% and 60% from the peak. A South Dublin family home that cost €750,000 at the peak had a typical mortgage repayment of about €3,150 – this is based off a 35-year mortgage, 4% average interest rate and a 95% loan-to-value. Assuming banks require a greater deposit of say 15%, to protect both lender and borrower from negative equity, this actually pushes down the mortgage repayment to €2,800. However, banks will also be reluctant to issue 35-year mortgages and so a 30-year ceiling would push up the repayment by €200 a month. More significantly, Irish households can no longer plan on interest rates of 4% and will instead be budgeting for interest rates of 6% on average of the lifetime of the mortgage. This pushes the repayment up a further €800. 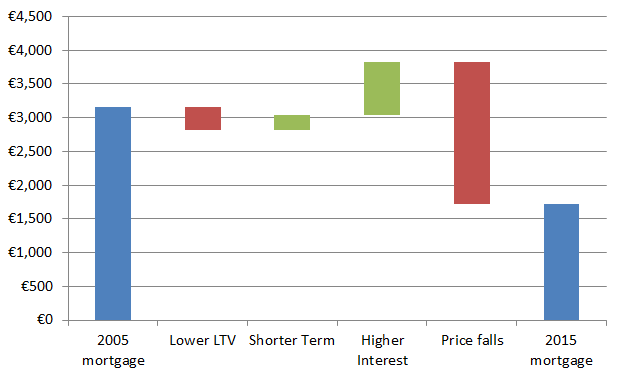 However, by far the largest impact is the fall in house price. A fall of 45% in the price of the house to about €340,000 would cut the mortgage repayment by over €2,000 to just over €1,700. So we know that incomes in Ireland have been stagnant the past few years, while taxes have risen but property prices – and thus accommodation costs – have been falling. What has been the net effect on Ireland’s ability to attract workers? How does after-tax, after-rent income in Ireland compare to elsewhere? The graph below uses OECD figures on incomes and taxes paid by the average family, as well as information from daft.ie and Global Property Guide on prevailing rents, to see how disposable income (i.e. after tax and after rent) has changed in six European cities of similar scale over the past decade. Information on rents has been used because this is easier to compare across countries (mortgage market considerations are left aside) and also because this is probably the more appropriate for executives considering relocating as part of an FDI operation. Growth in rents over the period 2000-2010 uses the housing component of each country’s consumer price index. A scenario for 2014 has been included – feel free to skip this paragraph if the details don’t interest you particularly. For cities other than Dublin, this scenario involves extending out 2009/10 growth rates in incomes, maintaining current tax burdens in percentage terms, and assuming growth in rents of 2%, in line with inflation. This latter assumption is used for Dublin also, but instead of extending the 2009/10 trend, which would mean falling nominal incomes, instead growth of 1% a year has been assumed instead, and the tax burden on the average family is assumed to be 18% in 2014, rather than 13%. The level of rents in each city in 2010 is assumed to be three quarters of the rent of that city’s prime areas (taken to be Dublin 4, 6 and 14 in Dublin’s case). The tax burden (the red bar) faced by the nuclear family in Dublin has been and will continue to be small when compared with other cities. This initially sounds promising – but it is worth remembering that very high tax-free allowances in Ireland mean that there is a large gap between the average rate (on all income) and the marginal rate (on the next euro of income). This is an economist’s nightmare, as it muddles with people’s will to work and means people feel heavily taxed even when they are not. The property bubble is clear when looking at the 2006 figures: the green bar gobbles up almost 30% of total income in Dublin in that year, compared to about 20% in the other cities. This appears to have fallen back somewhat – to about one quarter of total income – but is still high in international comparison. Figures using mortgage repayments (as per the graph above), rather than rents, may reveal a more dramatic change. Perhaps most importantly, though, disposable income enjoyed by a Dublin-based family compares favourably with income enjoyed by families in other cities. This will still be true in 2014, even if the tax base is increased between now and then (hopefully by reducing tax credits, not by increasing rates) and if incomes are static while rents rise slightly. The analysis above does not correct for difference in the cost of living, which would certainly have punished Dublin in 2006, as prices rose far in above of elsewhere in the Eurozone. Since then, though, as with wages, prices have been remarkably static, which if it persists augurs well for future competitiveness and creating jobs for the next generation. Increasing taxes while improving competitiveness is a tricky tightrope to walk, as disposable incomes take a hit. The last four years in Ireland have shown that it is possible – provided you have a property crash to unwind. Those that genuinely care about the prospects the next generation enjoy should see pretty readily that the more accommodation costs for families and businesses fall, the better off the next generation will be. The October Report of 2011 puts Irish banking debt at 279 billion euros. Yet you link to your article stating that the total debt will not exceed 50 billion euro, and state that much of that debt may well be repaid. None of these banks will ever repay anything. How do you justify your claims? Why are you ignoring the effects of the necessary reduction of rent allowance rates on the property rental market? The rise of the expression ‘rent allowance not accepted’ being included in Rental Ads would suggest the market already believes it will happen. So, are you ignoring it because you believe the government are still trying to prop up property prices / afraid of the impact on investor’s and additional bankruptcy’s or simply because the media have been largely ignoring this misallocation of public funds? The figure you’ve quoted is the entire loan book of the Irish banks. No-one believes that every last cent currently on their loan books will be lost, so the figure I’ve used is the total amount irretrievably lost by Irish taxpayers saving the Irish banking system. It’s based on two assumptions that may or may not balance each other out: that the aggressive recapitalisation of the banks in March 2011 will be enough (at least to the nearest billion or two), and that there is no large rebound in the value of the banks (thus generating a profit for the Irish taxpayer). The presence of ‘rent allowance not accepted’ on ads is precisely why one should not be hoping for too much from a reform of rent allowance rates. It is an indication not of a belief in their impending reduction but rather a statement that the rent allowance and non-rent allowance markets are, at least to those landlords, separate ones. Rent allowance rates are a price floor and price floors are either binding or not. I believe the price floor to be binding for one and maybe some two bedroom properties in the urban markets and perhaps a greater share of the rural rental markets. The logical corollary of that is that when the price floor is lowered, it will only have an impact on those segments. Put another way, if a landlord now rents out a 4-bed family home in Rathgar and will not consider rent allowance because that’s not the type of tenant she wants, she will be unaffected by a reduction in rent allowance rates. The state will certainly be able to save money by reforming rent allowance but I suspect most tenants will not notice any difference to their rents. Do you not think that the significant proportion of tracker mortgages taken out in the 2000s mops up a lot of the differences in mortgage repayments that you attribute to falling house prices. It would seem unlikely in the medium term (even a ten year window) that the bank margin driving available variable rates will go below 2.5%. Which is at least double most tracker increments. Also you assume no impact associated with the increased deposit. The saving required to generate this is surely an additional negative burden for a number of years prior to purchase. Your second point certainly may have an impact, although it should be remembered that having to raise 10-15% will not seem abnormal to those born after 1980, in fact any return to vaguely normal credit conditions will be a loosening of the credit constraint to those who in other circumstances would have bought in the period 2008-2012. Also, the first graph in the post wasn’t really intended to capture the macroeconomic impact of greater collateral requirements, just the impact on house prices. 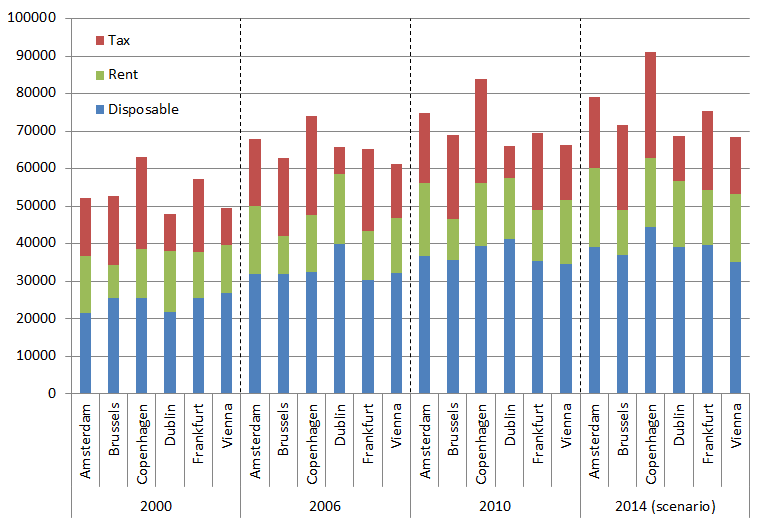 Ronan, thats all very well for assessing attractiveness of Dublin to FDI staff etc, but what about all those who’s green (rent/mortgage) is based on existing debt at pre bust prices and who’s tax burden (red) will also be increasing to 18%. Increasing competetiveness will be offset by much reduced disposable income for this generation. Very fair point – I did try to allude to that trade-off in the post, by contrasting those born in the 1970s with those born in the 1990s. But the point is that while the reduced disposable income/1970s group are effectively stuck here (due to negative equity), the 1990s group are not – hence the importance of increased competitiveness.